Economists suggest college is a great value, as every year of higher education translates on average into 6% more pay every year (see Part I). But if you ask the American public, the answer is not so rosy. 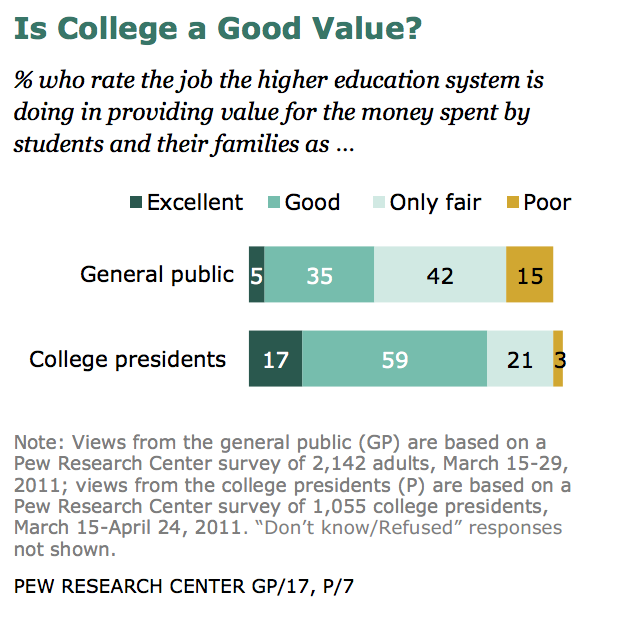 A Pew Research Center survey from 2011 shows that the majority of Americans think college is less than a good value. This raises the question of what informs that judgment. Is it that tuition has gone up without a concomitant rise in quality of the education offered? Is there an underlying perception of unfairness? Do people see other avenues to getting a higher wage? Does the hardship of coming up with the funds during college cause so much pain that future earnings don’t feel like adequate compensation? Do people really think they are subsidizing research that doesn’t actually improve the quality of the education one receives? Gaining a better understanding of what the real answers are would probably make a big difference to the overall college experience and to the way that colleges can market their services. Categories: educational debt, tuition | Tags: American public, higher education, Pew Research Center, value | Permalink.